 Cohen-­Gogo S, Do Ngoc Thanh C, Levy D, et al. Les troubles respiratoires du sommeil chez l’enfant. Arch Pediatr 2009;16:123-­31. François M. Le ronflement chez l’enfant. Arch Pediatr 2006;13:207-­10. Vontetsianos HS, Davris SE, Christopoulos GD, et al. Improved somatic growth following adenoidectomy and tonsillectomy in young children. Possible pathogenetic mechanisms. Hormones 2005;4:49-­54. Francois M. Indications de l’adénoïdectomie et de l’amygdalectomie. Rev Prat 2007;57:1778-­9. Stapleton A, Brodsky L. Extra-­esophageal acid reflux induced adenotonsillar hyperplasia: case report and literature review. Int J Pediatr Otorhinolaryngol 2008;72:409-­13. 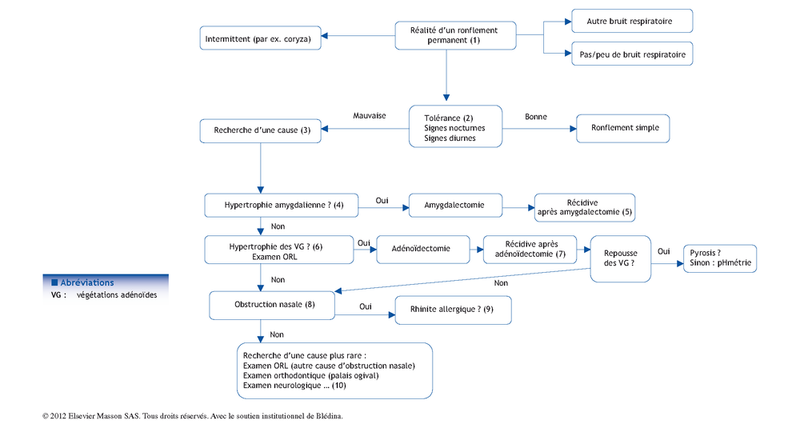 Alkhalil M, Lockey R. Pediatric obstructive sleep apnea syndrome (OSAS) for the allergist: update on the assessment and management. Ann Allergy Asthma Immunol 2011;107:104-­9.